Composites Evolution says that its Evopreg PFC502 prepreg has recently completed a series of tests. 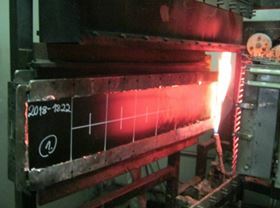 Composites Evolution says that its Evopreg PFC502 prepreg has recently completed a series of tests to demonstrate compliance with the Hazard Level 3 (HL3) requirements of rail industry fire standard EN45545-2. HL3 reportedly represents the most stringent requirement of EN45545-2, allowing materials to be used on trains that pass through tunnels where no side evacuation is possible, such as in many underground metro systems. Evopreg PFC502 prepregs are fire-retardant pre-impregnated composite materials based on a polyfurfuryl alcohol (PFA) thermosetting bioresin derived from crop waste. PFA is similar to phenolic resin but with lower toxicity and VOC emissions, the company says, adding that it can offer improved fire retardant properties, as well excellent temperature and chemical resistance. Evopreg PFC502 prepregs can be used to produce a range of interior components including wall and ceiling panels, seats, tables and vestibule areas. This story uses material from the Composites Evolution, with editorial changes made by Materials Today. The views expressed in this article do not necessarily represent those of Elsevier. Hexion Inc says that it has developed a phenolic resin for prepreg composites with a free formaldehyde (ULEF) content of less than 0.1%.